Concerts in the park have always been about community. Donations to cover the cost are raised through local civic groups and individuals giving generously to keep the music alive. Back in the 1980’s Coronado Beautiful, a small civic organization worked tirelessly to build political support and raise the funds necessary to build a bandstand, one the community could take pride in. Members passed the hat at concerts, sent out fund-raising letters, held a dance at Oakwood (now known as the Bay Club). One person gave the committee a Cadillac, committee member Joann Riley remembers. The car was sold at auction along with other donated items. Name rights were also sold. For $1,000 or more, a donor’s name would be inscribed on the copper plaque that adorns the face of the bandstand. “This brought in the big money,” said Ann Boyd, who also served on the committee. “It’s probably the most spectacular display of [financial] support…the community ever experienced,” said Floyd Ross, President Emeritus of the Concert Board. It was Floyd’s late wife, Mary Carlin King Ross, who took the fledgling concert program under her wing in the early 1970s and helped develop it into the summer series we enjoy today. Noted San Francisco architect Ed Wadsworth donated his talent. As a child, Wadsworth summered at Tent City with his family and as an adult he returned to that site, staying at the Shores. Wadsworth wanted to give back to the community. 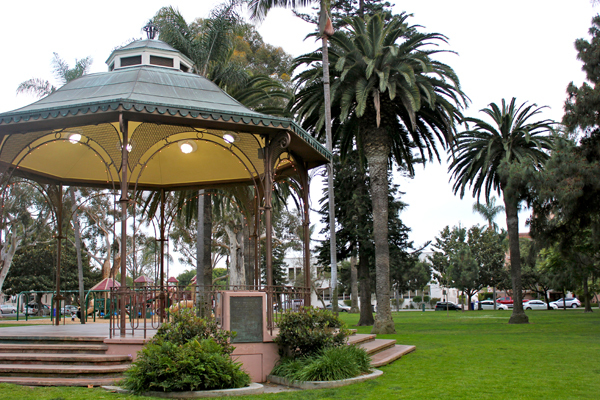 Toni Hoppe, who spearheaded the drive, first suggested building a bandstand in 1977 and took the idea to the Coronado chapter of Soroptimist International of Coronado. Members of that organization commenced raising funds and lobbying the city council. But change can come slowly to our community. Strong and loud opposition soon developed. Some worried that the park’s restrooms would be lost. Others argued that the center of the park was its focal point and should not be disturbed. “They were all upset because we wanted cut down a little ol’ skinny palm tree,” Riley said. Shying away from the controversy, the city council declined to take action but Hoppe would not give up. She brought the idea to Coronado Beautiful. The group had successfully sponsored the Memorial Garden in Library Park and was ready to take on a new challenge. It took four years to raise the money and gain city approval, but the group never wavered. After some 30 years, the controversy has faded. Restrooms were not lost and our park’s focal point is now a graceful and beloved gazebo with a much used bandstand staging all the fabulous bands for our concerts in the park.